In version 13.0.2 or later, Snagit can override the assigned hotkey if the hotkey is in use by another program. This commonly occurs when the Print Screen key is assigned to OneDrive or Dropbox. Click Yes for Snagit to override the hotkey assignment and allow Snagit to use this hotkey. If Snagit Editor and the Capture Window are closed, your computer reverts back to the original hotkey assignment until you open Snagit again. Click No to allow the other program to continue using the hotkey. This hotkey will not be available for use in Snagit. Open the Snagit Capture Window. Select File > Capture Preferences > Hotkeys tab. 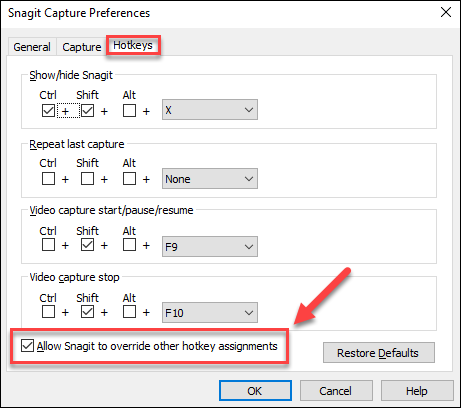 Check or uncheck the Allow Snagit to override other hotkey assignments option. Assign the desired hotkey to a preset or as the global capture hotkey. In the notification area, right-click the OneDrive icon and select Settings. On the Auto save tab, uncheck the Automatically save screen shots I capture to OneDrive option. If this option is already unchecked, check the box and click OK to apply the change. Repeat step 1 and uncheck this option. Scenario 1: Snagit and Dropbox are running and I am unable to assign Print Screen to Snagit. In the notification area, right-click the Dropbox icon and select the gear icon. Hover your cursor over the Snagit Capture Window. Click the gear icon and select Preferences. On the Hotkeys tab, assign Print Screen as the global capture hotkey. To set up Snagit to capture an image and send it directly to Snagit Editor, see this article. The hotkey will be assigned to Snagit even when you restart Dropbox. Scenario 2: When I restart my computer, Dropbox takes over the Print Screen key. In this case, we recommend disabling sharing screenshots to Dropbox. On the Import tab, deselect Share screenshots using Dropbox. To assign the hotkeys to Snagit, make sure to open Snagit before you open Dropbox.